Ravi is a techno-legal expert with about 15 years pharma industry experience in Intellectual property management, Business Intelligence, Regulatory and Legal affairs. He had worked with renowned Pharmaceutical and Biotech companies like Aurobindo Pharma, Cipla, Shantha Biotechnics, GVK Bio and Strides Arcolabs. Prior to joining with Jubilant, he worked with Strides Arcolabs as Head in IPR Department. Ravi is leading both IPR and Legal Department for both Jubilant Biosys and Chemsys. He plays an active role in managing the IP activities, confidentiality requirements and in negotiating the contractual relations with the clients. Ravi Madhira has done his M.Sc. in Biohemistry from Hyderabad Central University. 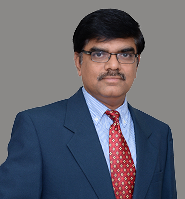 He holds a Bachelors degree in Law, PG Diploma in Intellectual Property Rights and another PG Diploma in Bioinformatics from Osmania University.